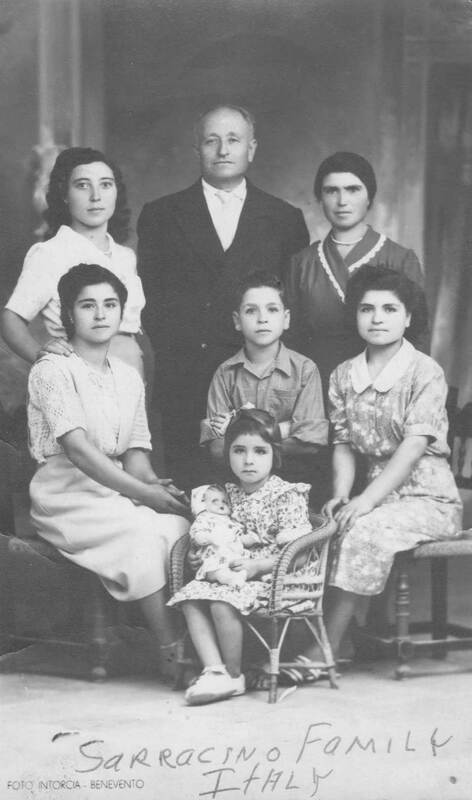 If you don't have at least 10 people in your family tree with the exact same name, you may be new to genealogy. My paternal grandparents followed this convention. They named my father and his sister after their paternal grandparents. My mother's family did not follow the rules. If they had, my grandmother and I would both be named Mary Louise. If I've left out your ethnicity, try a Google search including the ethnicity and "naming customs" or "naming conventions". Here's an example of an Italian couple who followed the rules, but put a slight twist on them. Giorgio and Maria followed the naming rules closely, but not perfectly. Giorgio and Maria named their first son and daughter after Giorgio's parents, Onofrio and Lucia. They named their second daughter after Maria's mother, Concetta. You can use your ethnicity's naming customs to help you place a person in a particular family. Let's say you have a man named Pietro Iamarino. (I have 11 of them in my family tree.) You don't have his birth or death record yet, so you can't confirm his parents' names. But 1 or 2 of his children's birth records call him Pietro, son of Giuseppe. When I examined the facts about my right-aged Giuseppe Iamarinos, one man stood out. This family makes sense, but I had to track down birth records to prove it. 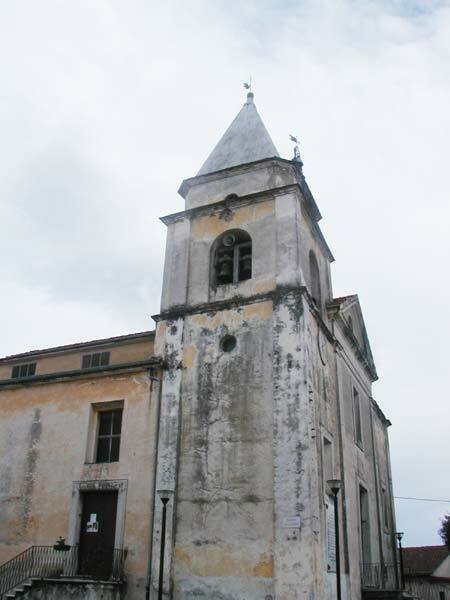 Giuseppantonio Iamarino was born in 1819 and married in 1840. That fit with Pietro who was born around 1848. Plus, Pietro named his first son Giuseppantonio—not Giuseppe. But that is not proof. It's an educated guess at this point. So I attached Pietro to Giuseppantonio, but I added a bookmark and a note to Pietro to remind myself that I needed to prove this relationship. The proof came later when I found Pietro's 1848 birth record. Use caution when you're piecing together ancestors' families from hundreds of years ago. Naming conventions can offer strong clues—clues that lead to a theory. But the names themselves are not the proof you need. Use these naming customs to form your theory. Then prove it. Keep searching for that proof and avoid making a mess of same-named, misplaced people in your family tree. When Did Your Ancestors First Use a Last Name? Stay connected! Follow me on Twitter or Facebook and know the moment a new article comes out. The church where my ancestors were baptized and married, 2005 and repainted in 2018. It happened again. One of those well-produced ancestry TV shows we all love traced not one, but two actresses back to European royalty. Is that what it takes to be an actress? Royal blood? I've gone pretty far back in my ancestry. I know the names of some of my sixth great grandparents on two lines, fifth great grandparents on another line, and fourth great grandparents on the fourth. They're all from poverty-stricken southern Italy. They're from five rural, tiny, neighboring towns. And the majority of them worked the land to grow their food and feed their small amount of livestock. 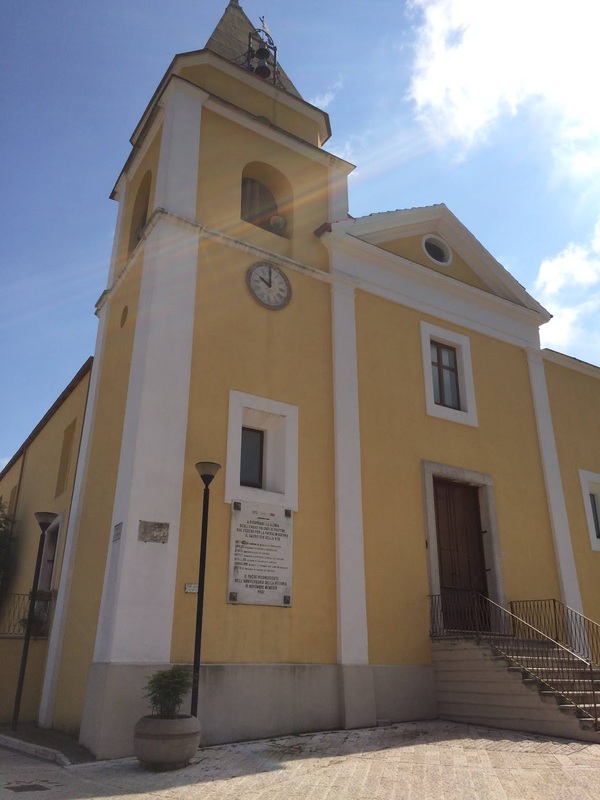 My grandmother's first cousin, Vincenzo Sarracino, never left our ancestral hometown of Pastene, Italy. This Thanksgiving I'm not making any fancy food. I'll stay true to my roots and make simple, real food. And I'll make sure my sons know where their roots grow the deepest. We'll toast our ancestral province of Benevento. Celebrate your heritage this holiday. Share some of your more interesting findings with your family. Be proud of where and who you come from. All my life I've called myself a purebred because my heritage is only Italian. I grew up with friends who were German-Irish-Italian or English-Irish or Polish-Italian. But I was all Italian. And that's totally true if you look back only several hundred years. To prove that point, my family tree—excluding my many in-law tangents—has only Italian names. DNA makes our ancestry research an entirely new ball game. What's imprinted on our chromosomes dates back to the origins of man. We can trace our ethnic makeup back thousands of years with an inexpensive DNA test. All the corners of the earth were not populated on Day One. 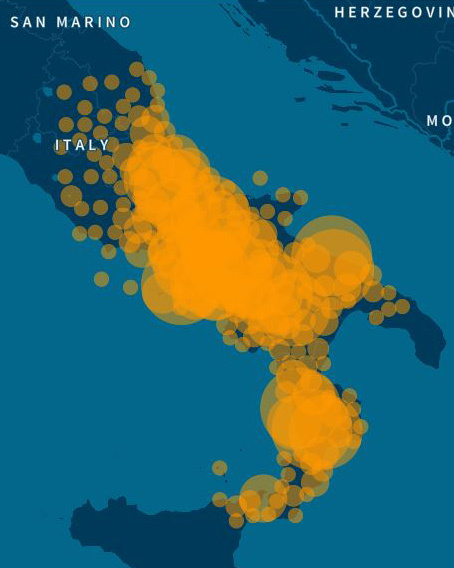 Those who became native Italians had to come from somewhere else. Testing both of my parents helps me see which one contributed what to my DNA makeup. Here are the specifics. If you test any set of parents and their child, you can do a similar comparison. Side-by-side comparison of Dad, me, Mom. 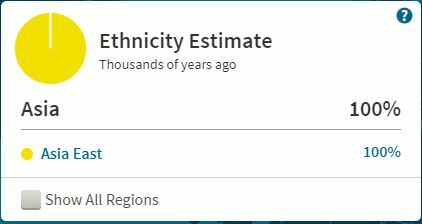 My ethnicity estimate includes 13% West Asian split between the Caucasus and the Middle East. It also includes 10% European Jewish. The rest is almost entirely Italian, or technically "Italy/Greece". 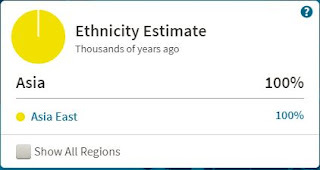 My dad's ethnicity estimate has less West Asian than I do and more European Jewish than I do. My mom's ethnicity estimate has much more West Asian than I do and a lot less European Jewish than I do. Since my dad's West Asian parts are classified as a "Low Confidence Region", I'm statistically more likely to have gotten those parts from my mom. And since his European Jewish parts are three times higher than my mom's, I'm statistically more likely to have gotten those parts from him. The part that tickles me the most is that I have a higher percentage of Italy/Greece than either of my parents! That's one of the fascinating things about DNA. You inherit a completely random 50% of your DNA from each parent. Since I didn't inherit all of their smaller-percentage ethnicities, I am more Italian than they are. Now take a look at my husband's DNA. One of us is truly a purebred, and it most certainly is not me. Another website goes further than Ancestry. My husband is 100% Japanese. Before Grandpa Came Here, How Did He Get There? Why Did They Come To America? Please take this 3-question survey to help me make this content better for you. Thank you! Why You Should Be Using the Free "Family Tree Analyzer"
Why Do You Work on Your Family Tree? Anyone who starts doing genealogy becomes obsessed with it. I'm no different. But...I am passionate about doing it right. I want every manic genealogy fan to care about their work. Do it correctly, thoroughly, and passionately. I'm offering you tips, resources, and concrete examples. Get inspired! Make your family tree the best it can be. Wouldn’t you like to leave the world your beautifully documented work of art – your fortified family tree? The powers that be want me to say this to you: To learn how Google uses data when you use their partners' sites or apps, see https://www.google.com/policies/privacy/partners. I am not collecting any information from anyone who reads this blog. Those who have chosen to subscribe by email receive ONLY a basic email notification with a link to a new article when it is published. I am not selling anything, and my ad revenue is truly a joke. ©2019 DiAnn Iamarino Ohama. Watermark theme. Powered by Blogger.